Since first contact with Europeans in 1492, Haiti has been a centre of resistance to tyranny. First enslaved by Spanish conquistadores, the aboriginal population was exterminated in the New World's first genocide. The African slave trade began in Haiti which, as a result, became the richest of France's colonies. The Haitian revolution, born of a slave revolt in 1791, was quickly followed by a crippling, extortionate debt to France. During most of the 20th Century, U.S. marines, corporations and death squads ruled the country. Haiti finally freed itself when Jean Bertrand Aristide won by a landslide victory in the 1990 elections. Months later, however, his government was removed in a CIA-backed coup. In 1994, after agreeing to follow U.S. economic dictates, Aristide was returned to power by American troops. After winning the 2000 elections, Aristide's government was ousted in 2004 during another U.S.-led coup, which received considerable backing from Canada and France. For two years, Haiti was ruled by an illegal, coup-installed, puppet regime that could not have survived without strong support from the U.S., Canada, France and UN-sanctioned "peacekeepers." This regime's reign of terror was a human rights disaster. With the complicity and assistance of UN troops, thousands of prodemocracy advocates were massacred and many more imprisoned without charge. Although foreign occupation governments and the Haitian elite tried to rig the 2006 elections, an Aristide-associate, René Preval, won. However, despite this electoral success for Haiti's impoverished majority, the country remains under occupation by UN-sanctioned troops which continue to conduct brutal raids killing innocent people in poor, urban communities where support for Aristide's return still remains high. 1803-04: Haitian independence fighters defeat Napoleon's army in the Battle of Vertieres. Shortly thereafter, Haiti declares independence from France and the emancipation of all slaves. Can't be havin' a nation of free niggers on America's doorstep so the U.S. ruling class begins a campaign of boycott and destabilization against Haiti. 1888: U.S. forces invade Haiti to force the release of an American vessel arrested for running a blockade. 1891-present: The U.S. invades Haiti to suppress a revolt of black workers against horrific working conditions on Navassa Island and seizes the island itself, which it still holds. 1914-34: The U.S. invades Haiti six times during 1914 and 1915 in order to seize revenue from Haitian customs houses on behalf of U.S. banking interests, primarily the National City Bank of New York. Each time, “domestic unrest” is used as the pretext for the illegal U.S. invasions. When the newly-elected president of Haiti refuses to hand over Haiti’s railroads and banks to the New York bankers, U.S. Marines invade once more, break into the central bank in Port au Prince and steal $500,000. The invading Marines remain in illegal occupation of Haiti, viciously suppressing ongoing resistance, slaughtering thousands, and running the country as a virtual colony until 1934. Among the duties of the freedom-loving Marines is the enslavement of hundreds of thousands of black Haitians who are forced to build roads and railways to carry stolen Haitian resources to waiting U.S. ships. The U.S. seizes Haiti’s gold deposits, re-writes the country’s constitution to allow foreign (read "American") corporate ownership of land and property and then forces their implementation, disbands the Haitian army and replaces it with a U.S.-trained and indoctrinated “police” force. In U.S. propaganda, the illegal invasions and occupation of Haiti, the murder and enslavement of its people and the theft of its gold reserves and resources on behalf of the New York bankers was simply the act of an always benevolent United States “maintaining order during a period of chronic and threatened insurrection”. A peasant uprising against the U.S. occupation is led by Charlemagne Peralte. Over a period of two years, U.S. Marines massacre fifteen thousand black Haitians. 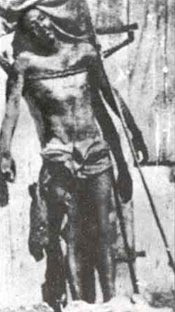 The freedom movement is crushed when Peralte is captured and murdered in November 1919 and his body put on display. U.S. Marines occupy Haiti until 1934. During the occupation, the U.S puppet president of Haiti is quite rightly barred from the U.S. Officers' Club in Port-au-Prince, because he is black. 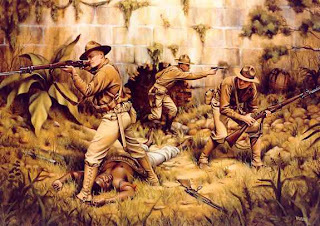 1915: U.S. Marines attack Caco resistance fighters attempting to end the illegal U.S. occupation of their country, slaughtering two hundred people and leaving not a single human being alive. Total casualties among the valiant Marines? One Marine was struck by a rock and lost two teeth. Leader of the massacre, Major Smedley Butler, says that his heroic troops hunted the Haitians "like pigs". 1920: U.S. troops slaughter two thousand Haitian peasants protesting the illegal U.S. occupation of their country. 1915-1934: U.S. Marines invade Haiti and impose a constitution on the helpless nation, seizing control of customs collection for American bankers. Thousands of peasants are forced off their land which is given to U.S. corporations. Forced labor (otherwise known as slavery) is imposed. and wealth?) Next look for locals who will collaborate with us to help achieve our ends. Of course there are always scraps from the table to be thrown to them. And most dogs are satisfied with that. In early 2004, a U.S.-funded, trained and armed paramilitary force of former CIA-backed death squads and soldiers from the military (that President Aristide had disbanded in 1995), attacked Haitian police stations, massacred government supporters and released human rights abusers from prisons. The U.S., Canada and France did nothing to assist Haiti's beleaguered democracy. Instead, they actually demanded that Aristide's elected government share power with political representatives of Haiti's wealthy corporate elite that had lost the 2000 elections and supported the rebels. On February 28, President Aristide was kidnapped and forced into exile by U.S. Marines, with considerable help from a foreign occupation force of largely Canadian and French troops. That day, Haiti's popular government—which had a clear mandate to govern until 2006—was illegally replaced by a puppet regime that was approved by Aristide's political opposition, the occupation governments and the UN Security Council. The brutal, coup-installed regime that ruled for the next two years was responsible for a reign of terror in which thousands of prodemocracy, pro-Aristide supporters were executed and many more jailed without charge. EN FRANÇAIS S'IL-VOUS PLAIT ! SPECIAL HAITI : Mais pourquoi sont-ils si pauvres ? Emotion et solidarité partout dans le monde. Mais pourquoi tant de victimes ? La Nature est-elle seule en cause ? Au Japon, par exemple, les normes antisismiques dans la construction permettent d'éviter un tel désastre. Seulement, dans un pays aussi pauvre, cela paraît impossible. C'est donc aussi la pauvreté qui tue. D'où vient-elle ? Notre dossier spécial éclaire l'Histoire cachée d'Haïti. Et l'énorme responsabilité, ancienne et actuelle, des grandes puissances - surtout les Etats-Unis et la France - dans cette misère atroce. La solidarité nécessite une véritable info. Merci de faire circuler. Qui sont ces Haïtiens ? Pourquoi sont-ils si pauvres ? Quelle Histoire nous a été cachée ? Comment les USA ont pris le contrôle de ce que mangent les Haïtiens. Et de ce qu'ils ne mangent pas. "Ce n'est pas Dieu qui débarqua dans l'île en 1915 et l'occupa pendant vingt ans, ce n'est pas Dieu qui..."
Michel Collon - "Sans les esclaves, nous serions perdus!"